As Roaring Twenties musicians on the run from gangsters—by posing as members of a female jazz ensemble—Tony Curtis was never better (right down to his sly Cary Grant impersonation) and Jack Lemmon was nominated for an Academy Award (for a part first intended for Frank Sinatra and that Jerry Lewis turned down). 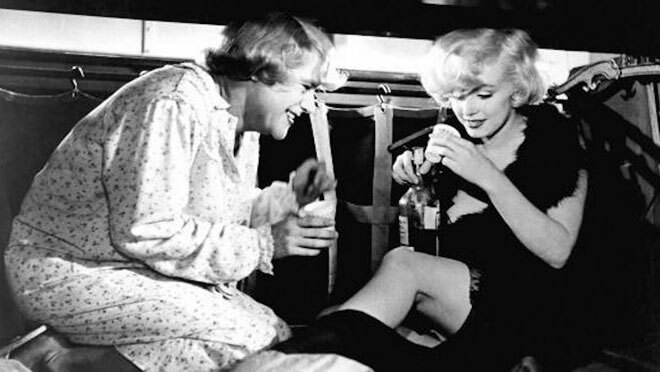 With no small help from her costars, however, Marilyn Monroe steals every scene she’s in as the band’s singer, even as she already is heading toward her self-destruction of three years later, driving writer-director Billy Wilder and the cast and crew to almost homicidal distraction after 59 takes of the line, “Where’s the bourbon?” This is the best movie of the sound era’s greatest female star, her unsung skills as a comedienne plainly tethered to the same vulnerability, even instability, that undid her, her performance of “I’m Through With Love” more personal than anyone intended except maybe Monroe herself. Wilder longed for Mitzi Gaynor in the role and was as wrong as Hitchcock longing for Vera Miles instead of Kim Novak in Vertigo. Inexplicably the first preview of Wilder’s comedy was a disaster, so of course the studio heads pressed him to reshoot. The director would have none of it and wound up reshooting anyway, because at the next preview people found the movie so funny that scenes had to be slowed so audiences could catch dialog lost in the laughter. The famous final line, “Nobody’s perfect,” was a place-holder until that time the writers could come up with something better, which they never did. The National League of Decency condemned this instant classic and almost immediately rendered itself obsolete; Kansas wouldn’t allow the film to be shown anywhere in the state, rendering Kansas obsolete too.